Can Topical Cannabis Be Used for Burns and Wounds? Cannabis is being used in various applications nowadays and has infiltrated almost every branch of medicine. While many believe that smoking is the only way to enjoy the full benefits of cannabis, its application actually spans way beyond this method. Both CBD and THC are capable of interacting with the endocannabinoid system and this leads to a modulating effect of the body’s physiological system. Studies show that the endocannabinoid system can be found in the skin where it’s significantly affected by growth, proliferation, hormone production, and apoptosis. What’s interesting is that cannabis has recently been showing promising results when it’s applied topically to treat wounds and burns. Cannabinoids are said to contain anti-inflammatory properties that potentially assist with the pain management and healing process of these conditions. Some cannabinoids have also been shown to contain antibacterial properties, which makes them an effective first aid treatment for injuries. The endocannabinoid system plays an important role in the overall physiological process of healing wounds. A research done at the China Medical University investigated the occurrence of cannabinoid receptors in mice. Through incisions, the mice were inflicted with small wounds. CB1 receptors were found in the injured part and their presence acts as a binding site for the THC to be able to exert anti-inflammatory, painkilling, and antibiotic effects. One of the biggest concerns when it comes to treating a wound is keeping it clean. Preventing the bacteria from getting into the injured site is important in order to prevent infection. This is when the cannabinoids come in. Cannabinoids like THC, CBN, CBD, CBG, and CBC all inhibit antibiotic actions. A research paper in 2008 showed that all these cannabinoids are potent against the Staphylococcus aureus, which is a dangerous human pathogen capable of infecting wounds. Such bacteria could trigger soft tissue infections like cellulitis, impetigo, cutaneous abscesses, pyomyositis, and necrotizing fasciitis. Burns are classified according to their depth and are categorized as 1st, 2nd, or 3rd-degree burns. All these classifications are also associated with pain, and most of the time, 3rd-degree burns would need to be treated through skin grafts. However, 1st and 2nd-degree burns can be treated through topical applications like Aloe Vera cream. Cannabis treatment for burns has been shown to effectively treat the pain that comes with burns, and both THC and CBD are showing potential in this field. Cannabis has also been shown to possess a compound known as terpenes. These are chemicals found in various plant species that are responsible for the pleasant smells in certain cannabis strains. Some of the terpenes were also showing a potential in treating burns and inhibits antimicrobial activity on some animal models. The terpene linalool possesses painkilling and cooling properties, which makes it a perfect treatment for burns. 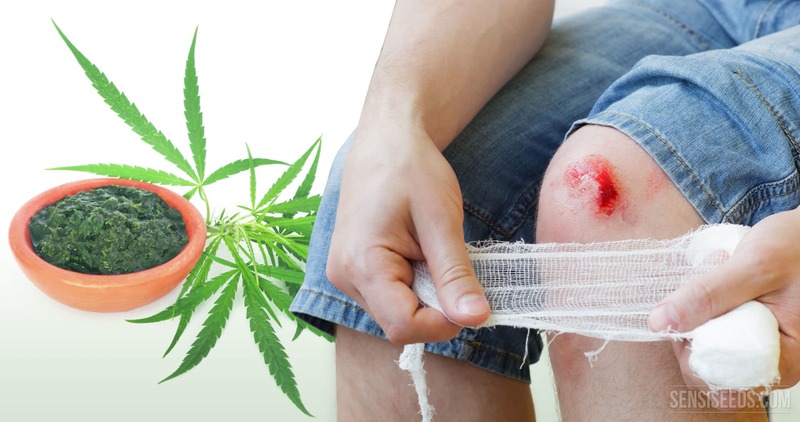 Can topical cannabis heal skin abrasions and wounds? Can CBD Cream Treat Bruises, Wounds and RAD Burns? Previous PostPrevious Can Cannabis Be Frozen?